A friend came over to see the layout of our kitchen and to discuss a Kids Cooking Class the two of us were donating to an upcoming fundraiser. 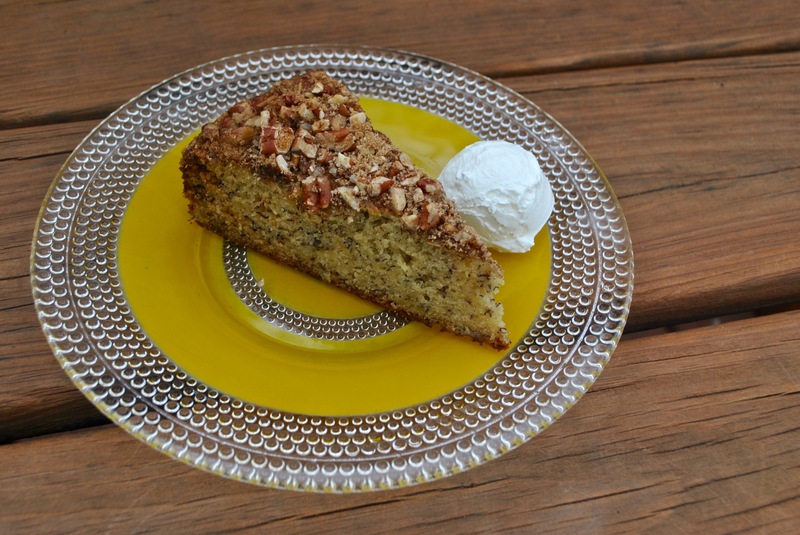 I was totally preoccupied with cleaning out my house for the Washington School home tour that was quickly approaching, and although I did manage to boil the kettle and prepare the French Press so I could pour a cup of coffee, I was rather embarrassed about the lack of refreshment available – not even as much as a sliver of this Roasted Banana Coffee Cake to offer my guest – which, although baked later that day during a cleaning lull, was too late to share with my sweet friend!! Heat oven to 350F. Butter a 9-inch round cake pan with 1 tablespoon of butter, dust with sugar and tip out any excess. Place the bananas on a rimmed baking sheet, roast for 15 minutes. Remove from oven and set aside to cool. In a small bowl, combine the pecans, brown sugar and cinnamon. Set aside. Sift flour, baking soda, baking powder and nutmeg into a medium bowl. In the bowl of a stand mixer, beat together the butter and sugar on low speed until light and fluffy, 2 to 3 minutes. Add the eggs one at a time, mixing well after each addition. Scrape down the sides of the bowl with a spatula, then add the roasted bananas, sour cream and vanilla. Beat until incorporated. With the mixer running on low speed, slowly add the flour mixture and mix until just combined. Pour the batter into the prepared pan and smooth the top with a spatula. Sprinkle evenly with the pecan topping. Bake for 40 to 45 minutes, or until a toothpick inserted into the center comes out clean.